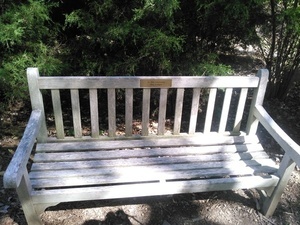 A bench inscribed simply “Dr. Elsie Quarterman, Plant Ecologist” sits under cedar trees in the herb garden at Cheekwood Botanical Garden; appropriately for a scientist whose specialty was cedar glades. This entry was posted in Elsie, Gardening, History, Okra Paradise Farms, Plants and tagged Anne and Charles Roos, Brown Dog, Cedar glade, Cheekwood Botanical Garden and Museum of Art, Cheekwood Botanical Gardens, Cheekwood Herb Study Garden Endowment Fund, Elsie, Elsie Quarterman, Gardening, Georgia, Gretchen Quarterman, Herb Garden, Herb Society of America, Herb Society of Nashville, History, John S. Quarterman, Lowndes County, Okra Paradise Farms, Plant Ecologist, Plants, Radnor Lake, Vanderbilt, Warner Parks, Yellow Dog on October 10, 2016 by John S. Quarterman.